Guest post by Guy Azouri. Entering into another year is often a time for reflection on how things have changed over the last twelve months. However, in the digital world of marketing and website development, the key to success is always having at least one eye on the future. 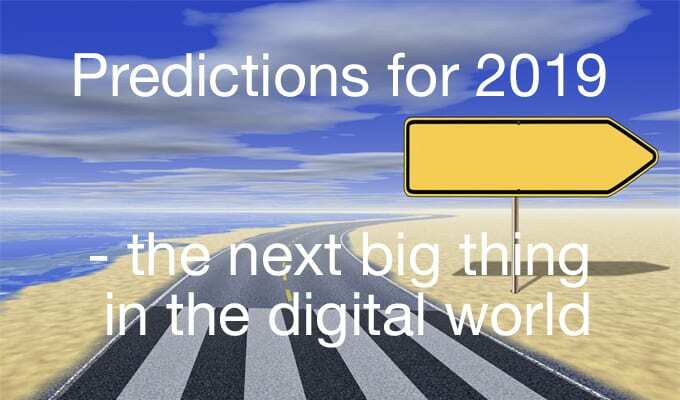 You should ask yourself “What digital trends are likely to present themselves as we head into 2019?”. Here are some likely areas of interest in the digital world for the forthcoming year, where you might be interested to concentrate some of your company’s online presence. How we search for things will continue to develop and change in 2019. A key change in recent years has been the proliferation of voice searching technology including Apple’s Siri and Amazon’s Alexa, with many companies creating their own voice-activated facilities. This technology will continue to become ever more ubiquitous as voice recognition becomes more accurate. Of course, it’s not just voice searches that will have an impact in 2019. With Amazon’s partnership with Snapchat, visual searching could well be the Next Big Thing in terms of customer interaction: simply taking a photo of something and letting your search engine bring up a number of options online relating to the item. As Google’s algorithms become ever more sophisticated, the possibility of being able to cheat the search somehow to rank your website higher than it deserves will become almost nil. The quality of your online presence will mean more than the number of keywords you can stuff into your website’s header text. Indeed, for 2019 content marketing will be key, necessitating the production of high-quality content that can be shared and liked by real people to help boost that all-important Google ranking. The digital world will develop with people willing to share good and engaging content on Facebook, Twitter, Instagram, and so many other platforms, this should also form part of any social media marketing plan. Something every digital marketing agency should keep an eye on throughout 2019 is blockchain technology. Created as part of the Bitcoin phenomenon, it is now being applied to thousands of other industries, including digital marketing. Future developments will allow you to track how consumers interact with your marketing campaign, giving you a much more detailed breakdown – right down to individual clicks – of where your customers come from, how long your advertising holds them, and at what point their interest converts to a sale. At the moment, Google Adwords rules the roost when it comes to paid advertising, and that seems set to continue into 2019. As more and more companies utilise the service, expect greater competition in the digital world for those lucrative advertising slots. The key to beating the odds? Careful consideration of search terms and a relevant landing page are the two areas likely to pay the best dividends. When it comes to blogging, the big trends for 2019 is likely to be greater immersion. Audiences want to be involved with the bloggers they follow. In practical terms, this will involve a two-fold strategy. First – more video content. Even if you’re primarily a traditional text blogger, video content will become crucial for building your platform. It consistently gets more hits than text or audio, and you can use it to hook fresh consumers and direct them to your main blog where the real meat is. This is the second part of the equation – people want longer and more in-depth blogs. The old days of short and snappy blog entries to keep the numbers up are long gone. As previously mentioned, quality will win out over quantity every time in 2019. Think of blog posts in the region of 1000 to 1500 words, with a traditional article structure of premise, argument, and conclusion. The market for bloggers is bigger than ever, but you need to set yourself apart from the crowd by producing superior content. So there you have it. Five digital trends for 2019 that we should all be keeping an eye on if we hope to make the new year a successful one for our online brands. Guy Azouri is founder of anova, a international digital marketing agency based in London, which helps businesses build and develop their online presence.